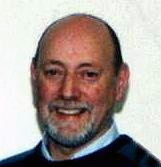 The Speaker at the February meeting of the Bellaghy Historical Society was Mr Thomas McErlean, N.U.U., well known Archaeologist, who spoke about The Oldest Tide Mill in the World, which he and his colleagues had the honour of discovering and identifying at Mahee Island on Strangford Lough in recent times. He brought with him a beautifully illustrated book which has just been published about this project, co-written by himself and his colleagues. Mr.McErlean explained that in the course of excavating this area for the artifacts which are common to coastal areas known to have been settled in ancient times, (such as long boats and fish traps which they found in abundance) they were advised to investigate a well preserved Ring Fort on Mahee Island. Here they were puzzled by the existence of three half submerged stone walls set in triangular fashion on the seaward side of the Ring Fort. They had the appearance of an original fish trap, but did not fit the criteria as fish swim with the tide and the walls were not correctly located for this purpose. The archaeologists were originally granted two weeks to work on this and only at the eleventh hour when they had run out of time and after many hours of very heavy work, did they discover the first indications of a mill, driven by the tide, used to grind flour for the inhabitants of the Monastery whose dietary requirements meant that they ate bread twice a day. This proved to be a momentous discovery, and further excavations, which lasted for over seven years, disclosed three Mills, each one improving on the design of the last. Taking meticulous care the archaeologists were able to discover how the tide was harnessed to drive the mills, revealing the ingenuity of the Monks who had constructed them. All the evidence found enabled Mr McErlean and his colleagues to date the mills at 619A.D. making this a uniquely important archaeological find and one at which he felt privileged to be present. Thanking him for a fascinating talk, illustrated by exceptional slides, the Chairperson, Mrs Mary Breslin reminded members that the Speaker at the next meeting would be Mrs Valerie Wilson (Ulster Folk and Transport Museum) who will give on talk on the history of clothing entitled The Way We Wore. The meeting will be as usual in The Old School Centre at 8 p.m.
Thomas McErlean, Guest speaker at the February meeting of Bellaghy Historical Society. 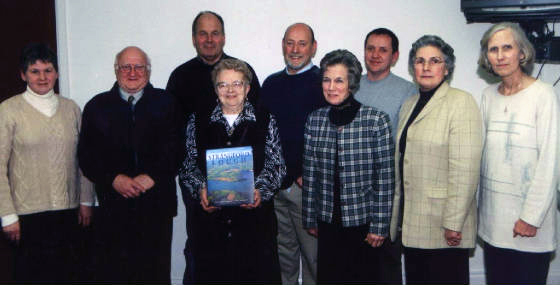 Members of the committee of Bellaghy Historical Society with guest speaker Archaeologist Thomas McErlean, (L-R) Mrs Hamilton, Sam Overend, Dermot Keenan, Mrs Henry, Thomas McErlean (Guest Speaker) Mrs Lowry, Colm Scullion, Mrs Evans and Mrs Breslin.